Phytoborg 3, Robot 33: “Surreal Evolution Series” Medium: Graphite on paper (bright vellum). Original Drawing Size: 18” high by 24” wide. Framed size: 22” high by 28” long (side-to-side width) by 1” wide (depth of frame). Year of completion: 2016. Showings: 2017 Art of Planetary Science juried show held at the University of Arizona’s Lunar and Planetary Science Lab (LPL). Description: Phytoborg 3 is part of a series of drawings (The Living Machines) that depict astrobiologyical landscapes. A “Phytoborg” is a vegetative lifeform that fuses machine and living plant-like elements. These vegetative machine-plants might be post-technology life or exo-biological forms of life. 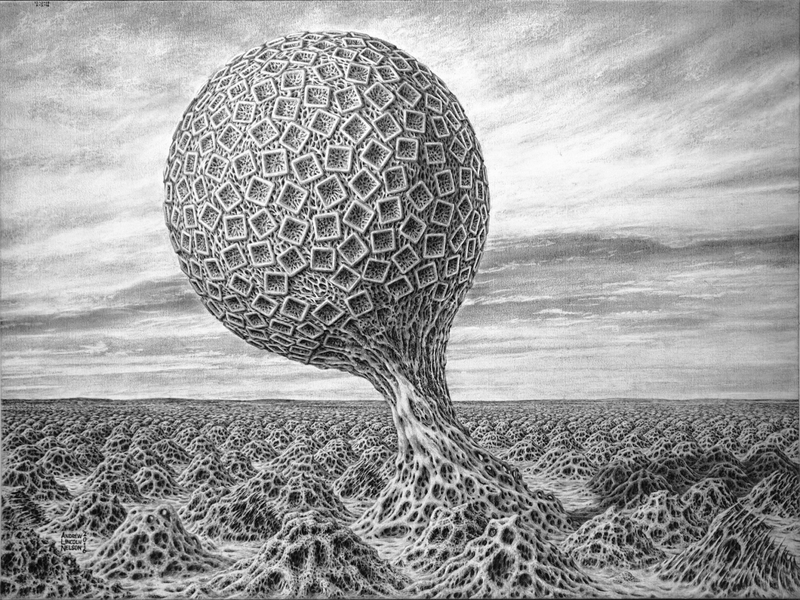 The spheroid “tree” in “Phytoborg 3” is organic in appearance, but is covered by square shapes that suggest a machine or non-biological origin. The surrounding ground in the drawing is covered by spongy fungus-like mounds that continue toward the horizon. These might represent some alien mono-culture landscape, but the mounds have slightly different morphologies.